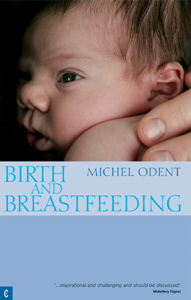 Humanity, argues Michel Odent, stands at a crossroads in the history of childbirth - and the direction we choose to take will have critical consequences. Until recently a woman could not have had a baby without releasing a complex cocktail of 'love hormones'. In many societies today, most women give birth without relying on the release of such a flow of hormones. Some give birth via caesarean section, while others use drugs that not only block the release of these natural substances, but do not have their beneficial behavioural effects. 'This unprecedented situation must be considered in terms of civilization', says Odent, and gives us urgent new reasons to rediscover the basic needs of women in labour. At a time when pleas for the 'humanization' of childbirth are fashionable, the author suggests, rather, that we should first accept our 'mammalian' condition and give priority to the woman's need for privacy and to feel secure. The activity of the intellect, the use of language, and many cultural beliefs and rituals - which are all special to humans - are handicaps in the period surrounding birth. Says Odent: 'To give birth to her baby, the mother needs privacy. She needs to feel unobserved. The newborn baby needs the skin of the mother, the smell of the mother, her breast. These are all needs that we hold in common with the other mammals, but which humans have learned to neglect, to ignore or even deny." Expectant parents, midwives, doulas, childbirth educators, those involved in public health, and all those interested in the future of humanity, will find this a provocative and visionary book. MICHEL ODENT was born in 1930. Originally qualified as a surgeon, he is popularly known as the obstetrician who introduced the concepts of birthing pools and homelike birthing rooms. His ongoing influential work in childbirth and health research has featured in TV documentaries such as the BBC's "Birth Reborn", and in authoritative medical journals. Odent founded the Primal Health Research Centre in London, which focuses on the long-term consequences of early childhood experiences. The Primal Health Research data bank (www.birthworks.org/primalhealth) features material which indicates that health is shaped during the primal period (from conception until the first birthday), and that the way we are born affects our sociability, aggression and capacity to love. He has also developed a preconceptional programme (the 'accordion method') to minimize the effects of intrauterine and milk pollution by synthetic fat soluble chemicals. Odent's other principal research interest is the non-specific, long-term effect on health of early multiple vaccinations. He is the author of dozens of scientific papers and 11 books published in 21 languages, including Primal Health and The Farmer and the Obstetrician.